Padang Bay (often spelt Padangbai). 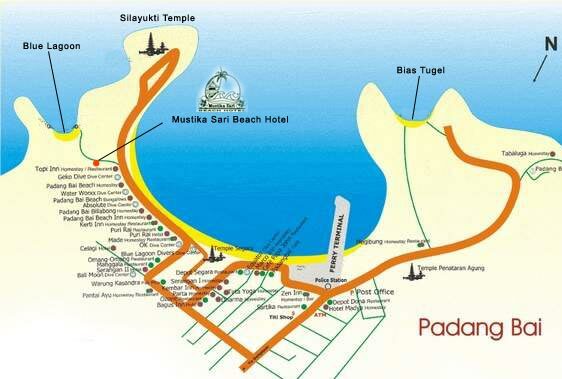 Padangbai is lively harbor used as a starting point for ferries and was where the first Dutch fleet found shelter. The beach-fringed village is a veritable melting-pot of Indonesia's myriad cultures and races and of seafarers who came to trade and stayed. Padang bay offers some of the best diving in Bali. Shark are seen on almost every dive, ocean sunfish are regularly spotted, fish life is exceptionally rich, the coral is healthy and the water is crystal clear. Padang Bay dive sites have strong currents and swell coming from Lombok Strait, creating unpredictable water movements. This is place to both careful and respectful. Negotiate a taxi/van for the day (small van only about US$50) There'll be plenty of taxis/vans at the jetty, they know when a cruise ship is due. Drivers are well-used to catering for cruise ships, they can suggest an itinerary, & they know the importance of back-on-board time. As usual, agree a price before you get in, pay on return. - for scenery, Kintamani volcano/Lake Batur. On the way back down, be sure to stop off for lunch at the terrace buffet restaurant overlooking paddyfields. Super spread, silly-cheap. And feed their pet bats, hanging at the front door .